England's smallest City, Wells is noted for its medieval cathedral (the current structure mostly built between the twelfth and fifteenth centuries although an earlier church stood here from around the early eight century) which has a stunning medieval stained glass collection and its Evensong. The Cathedral is adjoined by the medieval Bishop's Palace and Vicars Close (said to be the oldest remaining residential street in Europe with its original buildings), cathedral grounds and Well's Market Place which leadon to a small but charming town centre. 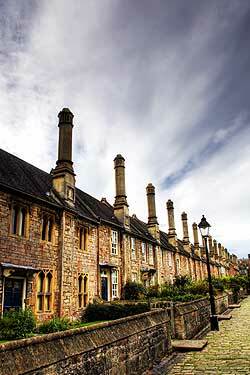 We suggest combining a visit to Wells with a visit to nearby Glastonbury or perhaps Longleat or Stourhead. Wells can be visited either on one of Celtic Horizon's suggested tour routes or build it in to a custom tour around your own requirements - contact us for details and prices.